Natasha uses a walking aid to help her stand and walk. Natasha has used this since the age of 3. It has been the most important piece of equipment she uses, using it daily. Over the years we have had a total of 9 new ones and literally hundreds of spare parts. 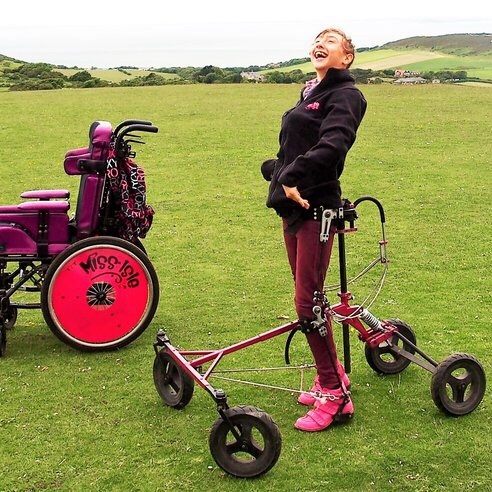 With using the walker daily and moving about as much as possible it has kept Natasha fit making sure she uses her all her muscles has helped bone development reducing fixed deformities and contracture, helping her lung development and capacity, it has had a huge positive impact on her general health. Natasha has needed no operations and needs no medication she is as fit as any of her able bodied piers! 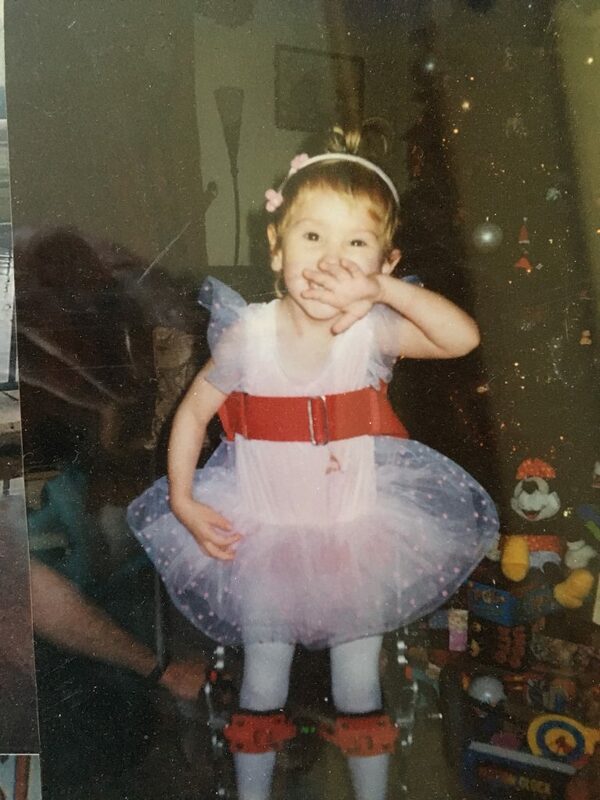 It takes about 15 minutes to help Natasha get into her body brace and walker and in a typical day Natasha will use it twice, morning and afternoon for about 4hours. Walking varying distances, often up and down the lane where we live, she loves a walk in the countryside, so not just flat pavements and seafronts, Hills forests and sometimes mountains!! Over the years we have worked closely with David Hart the inventor of the walker, who started from a small clinic in Yorkshire (to which we have made over 50 visits!) 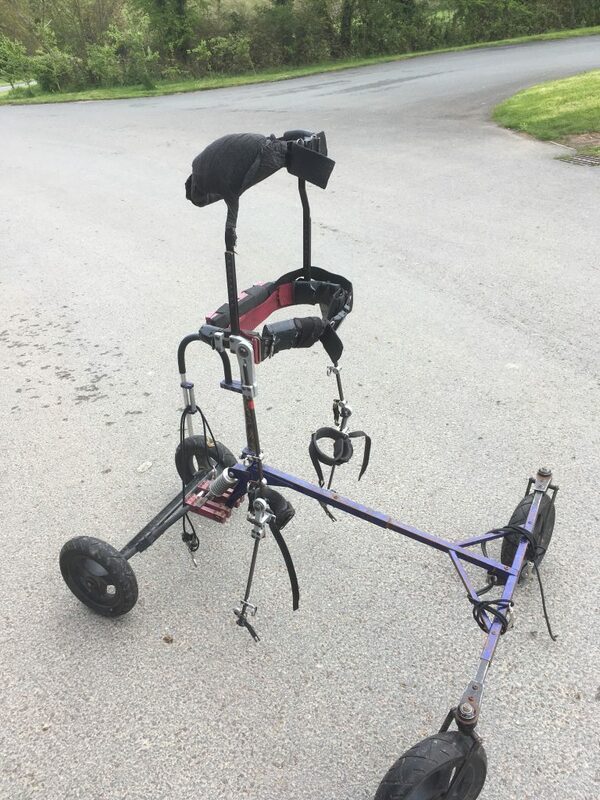 laterly David lives and works in France and we kept in contact and helped as he developed the original walker that had 4 small wheels into a more robust all terrain version. He would send us new parts that Natasha’s Dad Gary would construct and then Tash would Test the new versions and parts with bigger wheels and springs on various terrains, videoing and reporting back, eventually now the all terrain Walker is available and sold all over the world! It was a great project to be involved with and one that will hopefully help hundreds of other youngsters with mobility difficulties stay active.